Hellboy Winter Special 2017 is a 36 page one-shot featuring three Hellboy stories each with their own unique vibe. “The Great Blizzard” showcases a story without Hellboy but touching on some of the familiar themes of the series. “God Rest Ye Merry” gets a little silly as Hellboy essentially fights Santa Clause. Then there’s “The Last Witch of Fairfield” which gets serious again as Hellboy fights a witch to save two little girls. It’s an interesting mix with a little something for everyone. Looking at each story on its own, “The Great Blizzard” is the oddest. It’s not because of the artwork. Visually it fits in fine and looks pretty good. However, there’s no Hellboy in the story. It’s also very heavily driven by narrative. Yet given those two handicaps, it’s still kind of a neat story as it unveils some folklore about an ancient amulet and a wintery witch. The only shortcoming is that the story ends without feeling complete. It has a very “to be continued” feel to it as you want to see where the story is going with the amulet. It feels unfinished. Otherwise it’s an intriguing little story. “God Rest Ye Merry” is the weakest of the three. The biggest problem is the artwork which is very cartoony and disconnected from the feel of a classic Hellboy comic. It looks more like a newspaper comic strip than a Hellboy comic. Cartoonish artwork aside, the story is okay but it kind of mimics the art a little in that it focuses on Hellboy fighting Santa Claus. There is an evil necklace involved and a mysterious stranger, but it ends pretty quickly without getting too deep into the lore or the mystery. Wrapping things up is “The Last Witch of Fairfield” which turns things back around with some good visuals and stronger storytelling. Hellboy, Abe and Liz go off into the woods to find two missing children. They find them and, in turn, find a witch. As usual, Hellboy does the brawling and beats down the witch and her several forms. Meanwhile Liz talks with the girls. Liz’s chit chat fleshes out what happened to the girls, what happened to the witch, and what the witch is up to. However there’s some mystery to what the witch is doing that isn’t quite answered. Has she been doing this for a long time? Why? And did she really get defeated by Hellboy or did she come back to life? Unfortunately the comic doesn’t answer these questions and there aren’t enough clues to make a good guess. But it’s still a pretty good story. 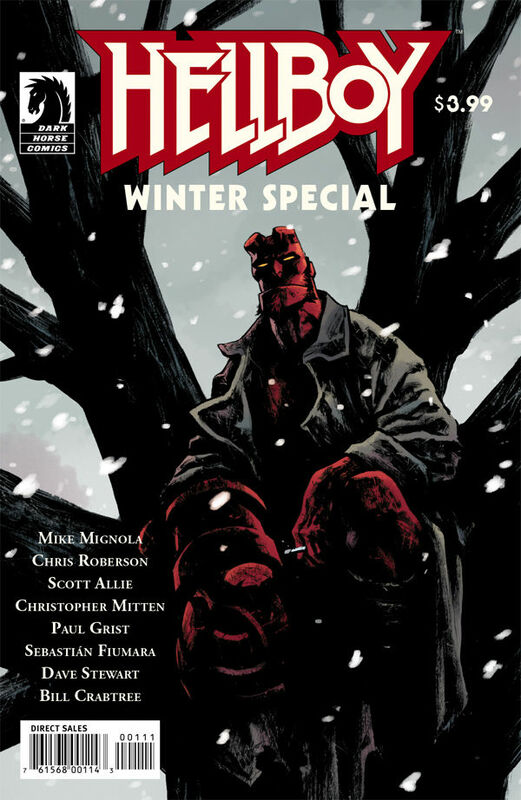 Altogether, the three stories give a good sampling of Hellboy tales that all have a wintery theme and lots of snow. With two of the three being worth your money, it’s worth checking out. I give it a four out of five metal bikinis.